Drawing the attention of search engines isn't easy, but it can be the key to the success of your home care assistance franchise. From acquiring a top Google ranking to ensuring your name, address and phone number are listed accurately across all online directories, there are many components that can impact the online visibility of your home care assistance franchise. We understand how important it is that consumers are able to find you online. That's why we have a comprehensive online marketing program in place to maximize the online visibility of your home care assistance franchise. The Visiting Angels marketing team works each month to optimize Internet search engine results within both sponsored links and natural Internet listings. Our website consistently enjoys excellent positioning on major search engines. This high ranking allows us to generate thousands of home care assistance client leads each month to share with our franchise owners. Our nationwide referrals and word of mouth leads are quarterbacked through corporate headquarters ensuring each home care assistance franchise receives the appropriate leads for their protected territory. All potential leads are documented by a live operator. Operators at our call center are available 24/7 to receive calls and ensure each potential client receives the initial support they need prior to your return calls. This carefully cultivated process has been perfected over time enabling Visiting Angels to become the industry leader in internet advertising. Independent reviews have rated www.VisitingAngels.com among the top websites in any industry for marketing effectiveness. We partner with web experts dedicated to establishing the strongest possible search engine placement for our site. 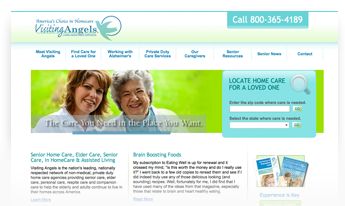 When you choose a home care assistance franchise with Visiting Angels, you'll be able to work with our carefully vetted internet marketing agencies to take advantage of comprehensive online marketing and reputation management services. Find out how a strategic and comprehensive internet marketing strategy can help your business thrive. Click the Get Started button for more information regarding home care assistance franchise opportunities from Visiting Angels.